Tickets on sale this Friday, March 15 at 10 a.m.! CHARLOTTESVILLE, Va. (March 11, 2019) – Returning for a seven-day run following the success of last year’s expansion to a week-long event, the 2019 Taste of MonticelloWine Trail Festival presented by Mercedes Benz of Charlottesville will return to Charlottesville to celebrate the best of wines in the Monticello American Viticultural Area (AVA) of Virginia beginning Monday, April 29 through Sunday, May 5. Events will take place at Vault Virginia, multiple area wineries and restaurants, and Sprint Pavilion. Tickets go on sale this Friday, March 15 at 10 a.m. and will be available at monticellowinetrailfestival.com and the Charlottesville’s Visitor Center on the downtown mall. Patrons will again have the opportunity to enjoy a variety of events available with optional VIP upgrades. 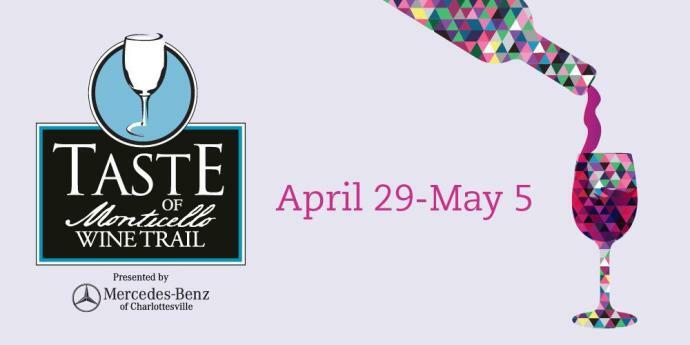 The Taste of Monticello Wine Trail Festival, an established spring tradition in Charlottesville, is a partnership between the Monticello Wine Trail, Sprint Pavilion and Vault Virginia, with presenting sponsor Mercedes-Benz of Charlottesville. The Monticello Wine Trail is a not-for-profit organization whose mission is to promote quality grapes andwine produced in the Monticello AVA. Dynamic winemakers, who are creating a unique wine region that features wines with an authentic expression of place, shape the region. The high quality of these wines is often recognized with success in national and international wine competitions. “The Taste of Monticello Wine Trail Festival is a great opportunity to experience all of what the Monticello AVA has to offer. Expanding the festival from three to seven days allowed us to schedule a wider variety of events so guests can create an intinerary that matches their personal tastes,” said MWT President George Hodson. o Wednesday, May 1 – Brasserie Saison Winemakers Dinner (Afton Mountain Vineyards & Jake Busching Wines). For event details and locations, visit monticellowinetrailfestival.com. These events will have limited tickets available depending on location. Please contact participatingwinery for more information. Wrapping up this year’s Taste of Monticello Wine Trail Festival, the 4th Annual Monticello AVA Sparkling Brunch will be held at Veritas Vineyard & Winery and will feature sparkling wines from five area wineries. The ticket prices includes food and a tasting from each sparkling producer. Additional glasses, or bottles, of sparklingwine can be purchased for on and offsite consumption.